The Advisory Board, comprises the Chairman, Mr. Teo Chong Tee (Honorary Group Chairman) and other professionals in the industry. The Committee advises the Management Team on market developments in the educational and related service industries. To advise on DIMENSIONS‘ Business Development Policies & Programs, particularly in relation to the Government’s Educational Policies on PEIs. To work and liaise with the Government Agencies to achieve DIMENSIONS‘ long term business objectives. To advise on the educational programs, quality improvement activities and educational excellence for DIMENSIONS. Mr. TEO Chong Tee (Zhang Zong Zhi – 张 宗 治), JP (太 平 绅士), BBM (公 共 服 务 星 章) was a Member of Parliament (MP), Singapore from 1976 to 1996. He served in the Changi Constituency for twenty years. During this time, he was concurrently a senior employee of the Singapore Airlines Group’s subsidiary company Singapore Airport Terminal Services (SATS). In September 1981, while in his capacity as SATS Grounds Operations Manager and MP Changi, Mr. Teo was seconded for a five-year term to the Singapore Government for a political appointment. He became the Parliamentary Secretary in the Ministry of Social Affairs. Subsequently, he was appointed concurrently the Parliamentary Secretary in the Ministry of the Environment. From 1985 to 1986, he was appointed the Parliamentary Secretary to the new Ministry of Community Development. Throughout the five years’ secondment, Mr. Teo held various government portfolios in different ministries and had acquired a vast knowledge of government practices by working closely with the civil servants. In April 1982, Mr. Teo was appointed the President of the Football Association of Singapore (FAS) initially for a three-year term by the Minister for Social Affairs. As a government appointee, Mr. Teo chaired the FAS Council, managing all local soccer matters as well as building up a good relationship between the FAS and those in the Asian football fraternity. Taking on the Chair, his priority was to spearhead an important and sensitive negotiation with the Football Association of Malaysia (FAM) for the return of Singapore’s participation in the yearly Malaysia Cup soccer competitions. In the early eighties, the FAS was suspended by the FAM from participating in these competitions due to certain unfortunate incidents and unforeseen circumstances that happened between high officials of the two football organisations. The FAM, nevertheless, was receptive of Singapore’s sincere representation in a series of our discussions with them. Singapore was subsequently re-invited into the Malaysia Cup competitions. Mr. Teo was re-appointed to hold the chair for a second three-year term. As President of the FAS, he was also elected as a Singapore’s representative in the Asian Football Confederation (AFC). Mr. Teo’s first employment following his completion of his secondary school education in 1960 was a temporary Teacher-in-Training. He quit after 18 months on the job. His illustrious career, however, started in Malayan Airways at Paya Lebar Airport on 2nd July 1962, commencing his first employment with an airline by working as a Junior Traffic Clerk. He then gradually worked his way up the rank in Malaysian Airways, Malaysia-Singapore Airlines, Singapore Airlines and SATS. He was appointed the Airport Manager for the airline at Taipei International Airport (Taiwan) from 1970 to 1974. With his vast experience acquired over the years in ground operations, he was elevated to the post of Vice President in the SATS Passenger Services Division. His job entailed a high level of customer service on the ground. This had helped Changi Airport achieve its accolades as the BEST airport in the world for several years. Two years prior to his retirement, he held the post of Vice President in the SATS Cargo Services Division. He gracefully retired from SATS on 1st July 2003 after completing 41 years of his dedicated, loyal and conscientious service in the airline industry. For his contributions made to the state and the community as a Parliamentarian, Mr. Teo was appointed the Justice of the Peace (JP) by the President of the Republic of Singapore in 1998 for a term of five years. Since then, he has been re-appointed for another three terms. As a JP, he also volunteers his service as a Deputy Registrar of Marriages or Licensed Solemnizer who performs marriage solemnizations for couples outside the Registry of marriages. At the same time, he has been appointed by the Minister for Home Affairs to serve in several other committees managing affairs in the Singapore Prisons Service. Currently, Mr. Teo is a member of the Board of Visiting Justices. He is also the Chairperson of the Home Detention Advisory Committee and Employment Release Advisory Committee as well as the Vice-Chairperson of the Reformative Training Advisory Committee. These are challenging tasks that make Mr. Teo’s retired time well-occupied for a good cause. On 9th August 2009, Singapore’s 44th National Day, Mr. Teo was conferred with The Public Service Star (BBM) by President S.R. Nathan for his invaluable contributions in the Singapore Prisons Service. 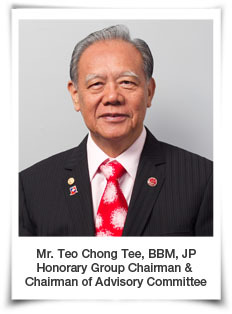 Mr, Teo joined DIMENSIONS International College as its Honorary Group Chairman and Chairman of Advisory Committee in July 2005. He has been in this college since then and has contributed to the growth of the college with three campuses over the years.